TEMPE – Hockey leaders in Phoenix unveiled an Arizona Coyotes jersey with the No. 15 and Sun Devils on the back Wednesday, signifying a union of the two hockey giants. Nine months after announcing it would go Division I in the 2015-16 season, Arizona State partnered with the Coyotes, who will host two of the Sun Devils’ regular season home games at Gila River Arena, and a four-team tournament, the first of its kind in the southwest. The plan down the road: For Gila River Arena to become ASU’s full-time home. “What a tremendous day to celebrate what, in my opinion, is the greatest game on Earth here in Arizona,” ASU coach Greg Powers said. “I have been very vocal since day one that the growth of our game goes further than Arizona, even out west. The Coyotes echoed Powers’ excitement with the partnership. 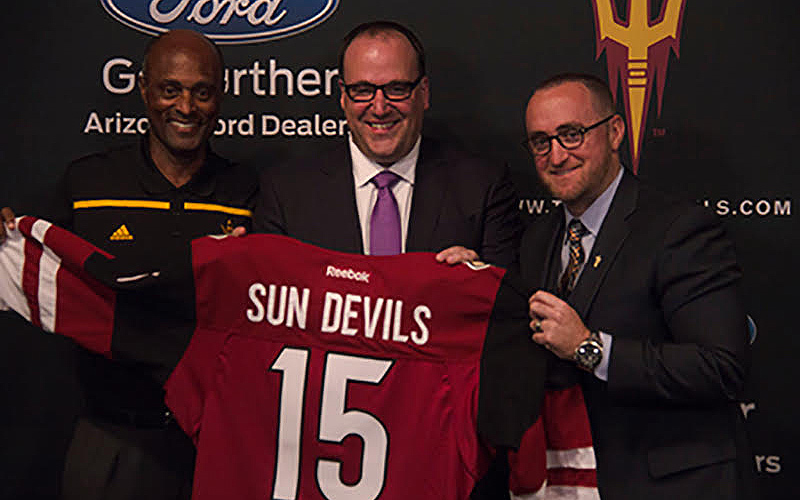 As soon as the NHL team heard of ASU going Division I, the organization reached out to the Sun Devils to support the move. The regular season games at Gila River will feature the opener against Arizona Oct. 3 at 7 p.m. and a game against the USA 18-and-under team in February. Along with ASU, UConn, Michigan Tech and Yale will play in the Desert Hockey Classic Jan. 8 and 10. On Jan. 9, the Coyotes play the Nashville Predators, filling out a three-day hockey weekend. That, Powers said, could lead to a full schedule at Gila River. The Sun Devils currently play at Oceanside Arena in Tempe. “We’re going to play as many games as Anthony will let us out there,” said Powers.